El Nińo 2015: Largest ever? A 2010 flood in Peru. 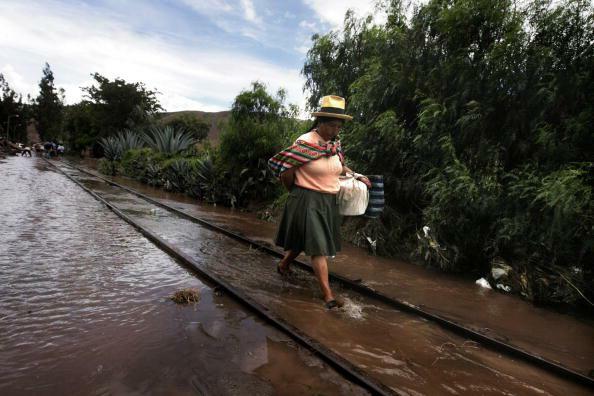 More flooding in Peru—among many other consequences—is likely if 2015’s El Niño is as severe as recent readings indicate it will be. Last year at this time, I was harping about the “monster” El Niño that seemed to be brewing in the tropical Pacific Ocean. It didn’t pan out. But from the looks of the latest data, I was just one year too early. Despite last year’s false alarm, there are several reasons to believe that this year’s version of El Niño is the real deal. First off, it’s rapidly intensifying. El Niño is about self-reinforcing feedbacks between the ocean and the atmosphere, and from all accounts, this one has its foot on the accelerator pedal. If it continues, the impacts will be felt around the globe—here’s my detailed rundown of what to expect. Among them: drought in Australia, Southeast Asia, and perhaps India, with flooding in Peru and Southern California. For the first time since 1998—the year of the strongest El Niño on record, which played havoc with the world’s weather patterns and was blamed for 23,000 deaths worldwide—ocean temperatures in all five El Niño zones have risen above 1 degree Celsius warmer than normal at the same time. That’s the criteria for a moderately strong event, and the latest forecast models are unanimous that it’s going to keep strengthening for the rest of the year. 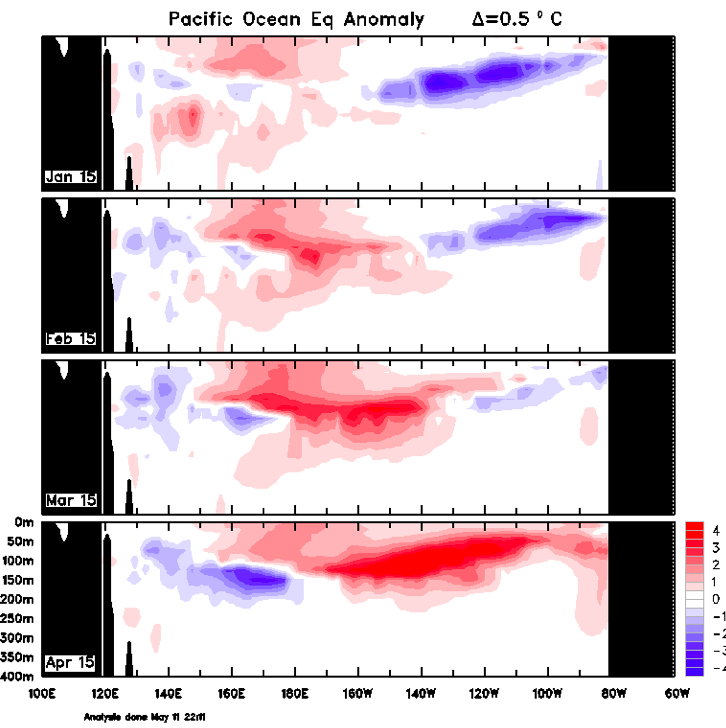 A sub-surface wave of warm water is driving this trend, which has reached off-the-charts levels during the first four months of 2015. Autumn outlooks made this time of year normally have an error of plus-or-minus 0.6 degrees Celsius, meaning the current forecast of a 2.2 degree warming of the tropical Pacific by December essentially locks in a strong event. 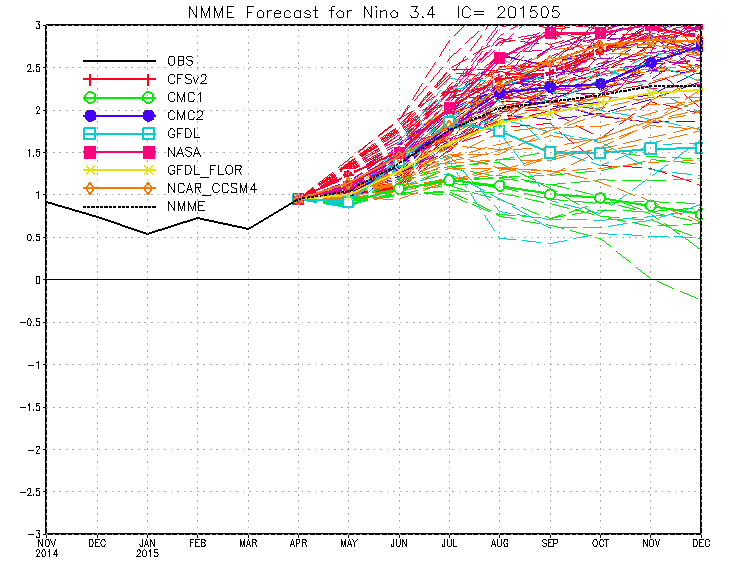 At the low end, we can expect the biggest El Niño since the last one in 2009-2010, a moderately strong event. At the top end, this El Niño could be the strongest in recorded history. The first glimpse at this winter’s forecast shows a textbook El Niño signal for the United States: abnormally wet in Southern California and dry in the Pacific Northwest. For those hoping for an end to the drought, multi-year rainfall deficits in California are now so huge that even a very wet year likely wouldn’t erase them. What’s more, heavy El Niño rainstorms frequently come to California via tropical atmospheric river events, also known as the Pineapple Express. While those rains can help fill dwindling reservoirs, they’re often too warm to produce significant snowpack in the mountains—which is crucial for agricultural needs during the following summer. Thursday also brings fresh evidence that 2015 is shaping up to be the hottest year in history. April’s global temperature data from NASA ended the warmest 12-month period since records begin in 1880. That record beat one set just last month (April 2014 to March 2015), which itself beat the record set just one month before that (March 2014 to February 2015). It’s almost like there’s some sort of trend or something. And a strong El Niño could help initiate a surge in global warming that could last more than a decade. A recent study also showed that strong El Niños themselves might become more common in coming years due to changing ocean temperature patterns associated with global warming—though that evidence is far from definitive.